Scrolling through the Google Play store last night, I was happy to find Snake Eyes staring back at me. G.I. Joe: Strike by Backflip Studios isn't a new game, but it was new-to-me so I thought I'd check it out. I was a big fan of G.I. Joe: Battleground which was discontinued at the end of 2014. The G.I. Joe universe is so broad that I found the card collecting RPG a really good fit for the franchise. But now, the lone mobile app for one of Hasbro's most storied properties has a much different approach. In G.I. 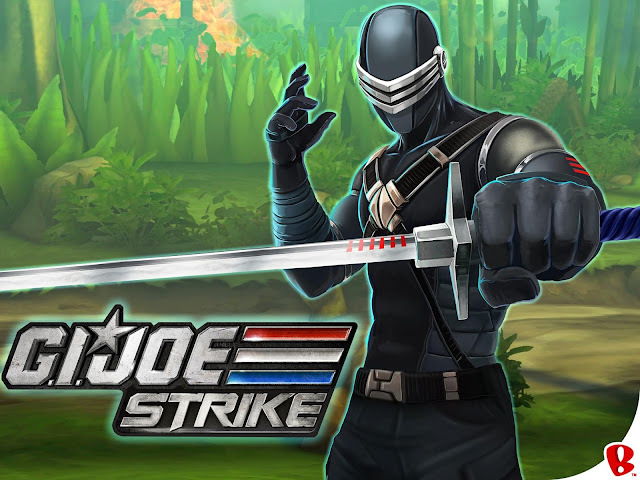 Joe: Strike, you take control of Snake Eyes in a fierce beat-em-up style action game. Punch, kick, and shoot an army of deadly Arashikage ninjas led by Storm Shadow in a covert mission across several backdrops. You'll fight in the jungle, at the dojo, and even aboard the U.S.S. Flagg! 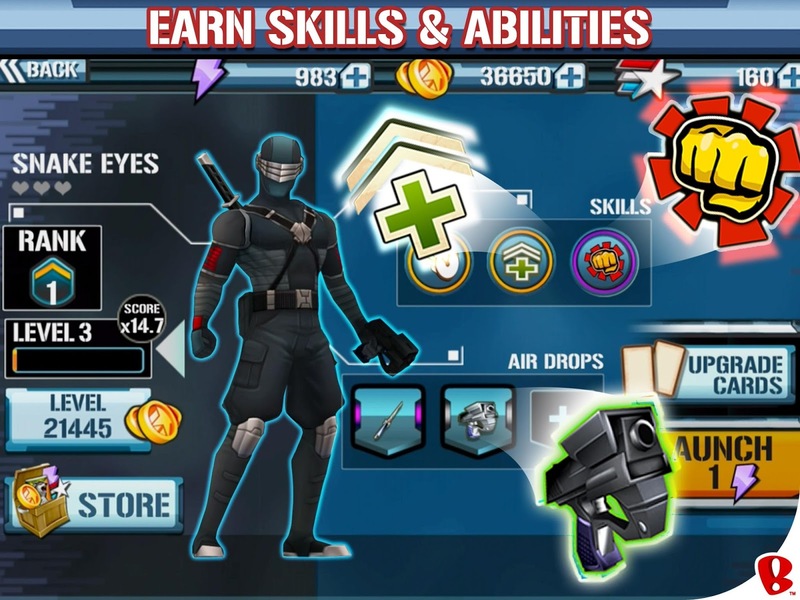 Upon completing missions, you earn gold and medals to upgrade your skills and weapons in fending off attackers. Unlock uncommon, rare, and epic cards to add to your profile and make Snake Eyes even more deadly. G.I. Joe: Strike uses energy to attempt missions which can be fully regernated every 90 minutes. 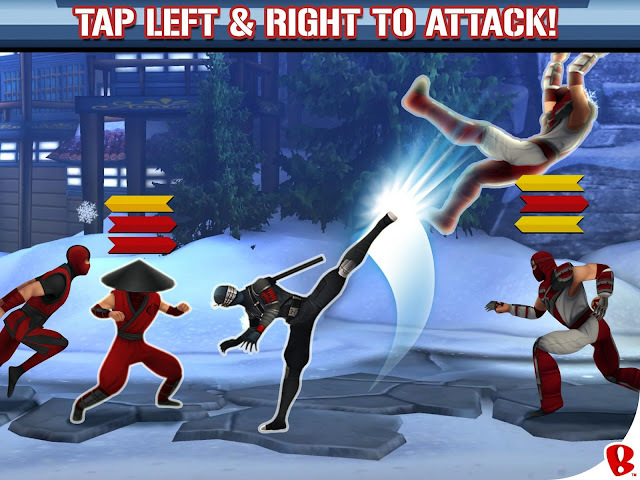 The gameplay is a left/right touch which engages an attack when enemies enter your screen. Some are defeated with a single blow while others including bosses like Storm Shadow require a combination to eliminate. Air drops and profile cards allow the use of weapon fire to assist in the battle. One feature I enjoyed was that you can get free energy up to level 5 which allows you to get a feel for the game while at the same time progressing through missions. At certain points, you'll have to achieve a rank in order to continue the mission, but you are able to replay previous encounters in order to level up. The app is free to download with in-app purchases for your energy, gold, and medals. I'm up to level 7 now and there is no doubt you will need more skills and weapons to progress in the game. The left/right touch gameplay is simple, but can be cumbersome with several enemies bearing down on you at a rapid pace. The graphics are fantastic and I really enjoy the multiple angles at which the enemies are defeated which includes being kicked toward the screen and not just side to side. The obvious downside here is that if you aren't much of a Snake Eyes fan, you probably will get bored pretty quick. There is currently no way to play as other Joes, however I'm planning to continue to play for awhile to at least put a little G.I. Joe back in my life.